I’ve been interested in the convergence of technology and everyday life. The ability to learn more about our own behaviors can be extremely enlightening. Prime example, Nicolas Feltron’s annual report. I’m a healthy guy, but by no means a health nut or workout addict, but I wanna make sure I stay healthy. I have inactive days behind a computer, active days photographing buildings, and then my sporting pursuits of ice hockey and fencing. I wanted to measure all that and then improve on it. This concept isn’t new. Nike’s been working on this for years with Nike+, largely for runners. It required a shoe attachment, and well running. It was interesting, but not for me. A similar product, Jawbone UP, had terrible reviews and a mass recall. I hoped the Fuelband would be better. Quick overview, the Fuelband concept is simple. 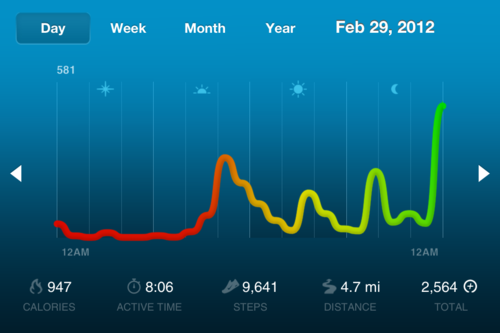 Set a goal for yourself, Fuelband keeps track of your activity as you try to meet and exceed your goal. A subtle black band with a slightly rubbery feel to it. One button interface, easy to wear, water resistant, and doesn’t get in the way of life. LED lights provide feed back on your day’s progress, only when asked for. The band isn’t quite as polished as the marketing images but I think that’s ok. The battery is rechargeable via standard USB and lasts 2-4 days between charges. Nike’s slogan is “Life is a sport. Make is count.” It’s all part of the message of challenging yourself, treating life like a game, always trying to better your totals. You meet your goal, you get on streaks, rewards, etc. In 13 days, I’ve burned 12000 calories, been active for 90 hours, taken 110,000 steps, and gone 54 miles via foot. I’m not quite sure what that means to me yet but as I have this longer I think it can help inform me to continue to make healthier decisions. Now we do. Make it count.